Today, we get the 4G LTE Cat4 Wi-Fi dongle Huawei E8278. Since the release day, it has been for a whole year that we get it. 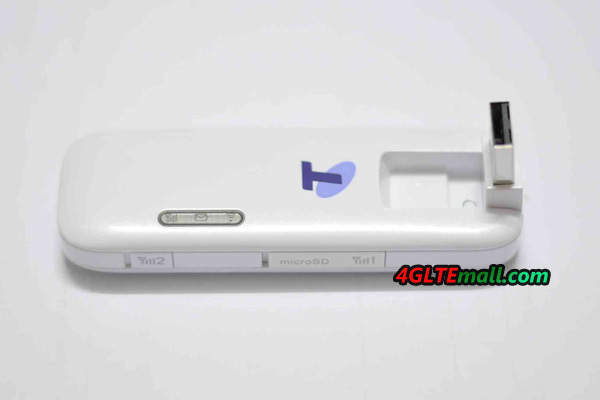 The model we get is Huawei E8278s-602, which is for Australia operator Telstra. 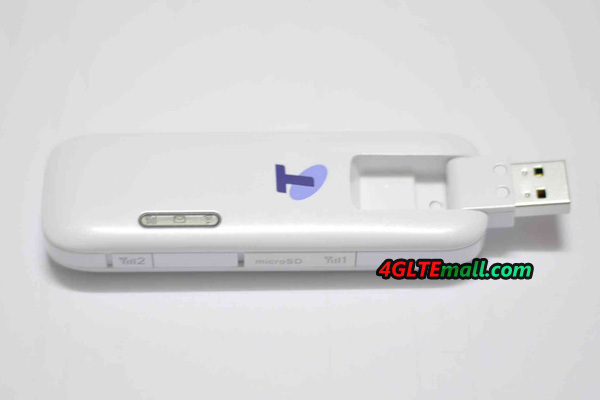 Packed in customized box from Telstra, Huawei E8278 is in the center box with a power adapter. There is a USB port in the adaper, which can help Huawei E8278 to get power supply directly, not from desktop or laptop. The USB is rotatable for 180 degree and hidden in the body of the modem. As we introduced before, Huawei E8278 looks like a 4G USB Modem, but actually it is a WiFi hotspot through which multiple terminals can access internet in high speed. E8278 is a LTE category 4 UE, which mean the maximum downlink speed could reach 150mbps. The official saying about Huawei E8278s-602 is that it could support 4G LTE FDD 800/900/1800/2600MHz & TDD 2600MHz. And the 3G DC-HSPA+ network support is backward. E8278 supports 3G UMTS Band 850/900/1900/2100MHz. The Huawei E8278 we get is SIM card unlocked. So if you get an unlocked E8278, you can take it around the world for travel. The Huawei E8278 would work with most operators over the world. Even on 3G network, the maximum download speed could reach amazing 42Mbps. On the body side, there are two external antenna connectors for external high gain antennas. One connector is with the MircoSD card slot. They are covered by a plastic cap. There is Signal slogan on the cap. The external antenna connector socket is TS-9. 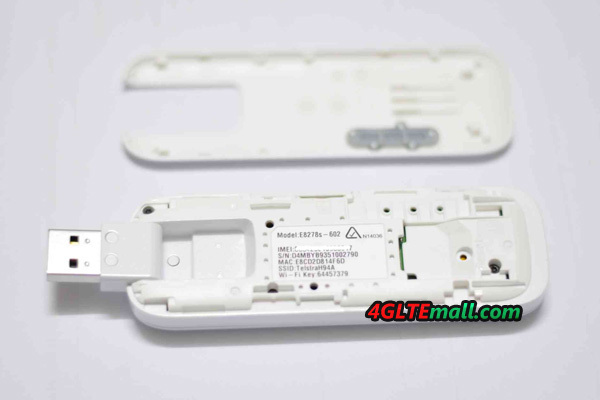 User can also get the 4G Antenna from 4gltemall.com . 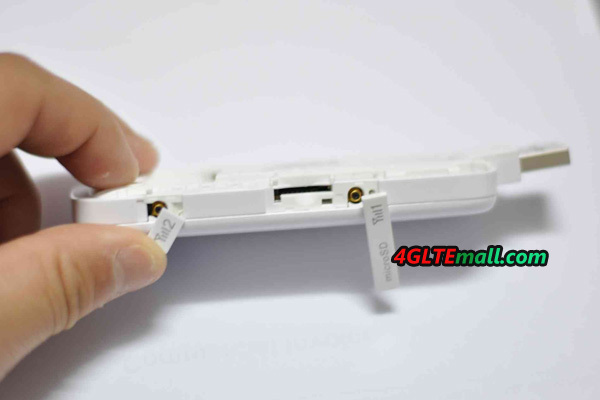 The Huawei E8278 4G Antenna has two connectors (TS-9 jack) and covers almost all the 4G Frequency bands. The antenna is small and easy to take in bag, just like Huawei e8278. Users don’t need to worry about the week network coverage if far from the center city. What’s more, the Huawei E8278 can support up to 10 WiFi users to share the wireless network and access internet simultaneously. With the ability of high speed data transmission, you don’t need worry about the slow speed when sharing the WiFi. It’s a pity that there is no battery included, otherwise, it would be a mobile pocket router. But Huawei E8278 is still a good mobile WiFi dongle worthy to have as a WiFi hotspot when there is power supply. 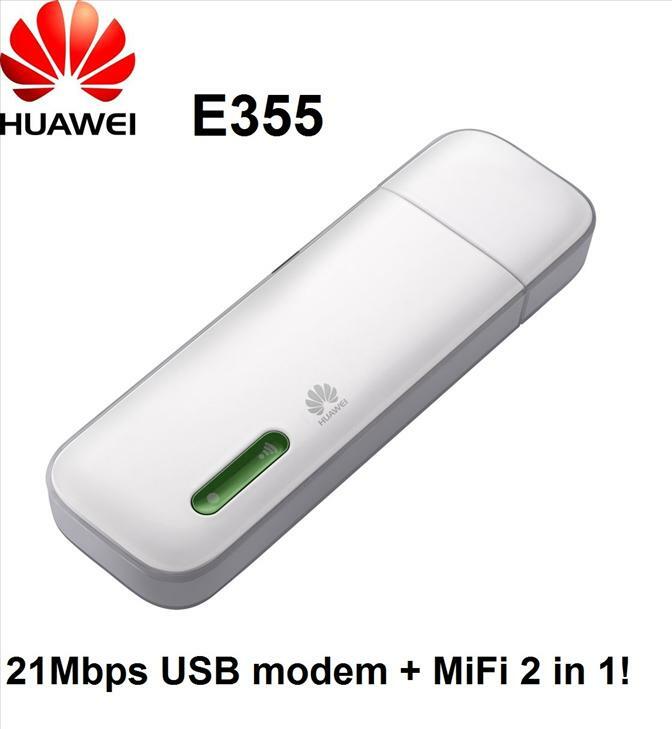 Before we start today topic, there is a question here: do you know Huawei E355 Mobile WiFi modem? If you are familiar with Huawei E355, you would know that Huawei E355 is a special model which falls in between USB dongle and Mobile WiFi, because even though it looks like a USB dongle, it can work like a WiFi router. 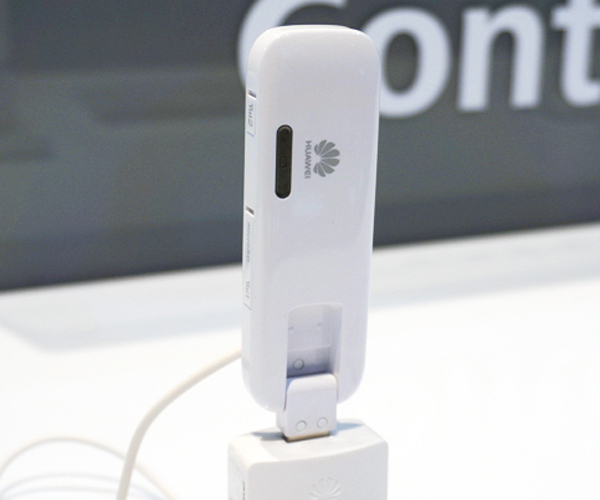 After plug Huawei E355 to PC or with power adapter, up to 5 users could get connected to it and surf Internet. The peak data transmission rate is 21Mbps. Similarly, there are new WiFi dongles released from Huawei to support LTE cat4 150mbps download speed. 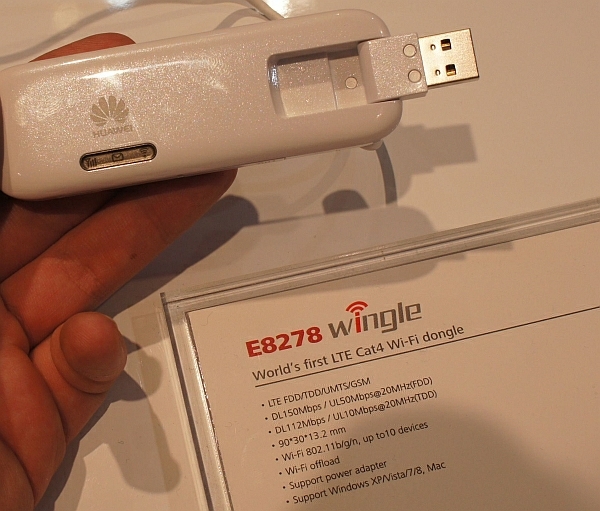 In MWC 2013, Huawei Wingle E8278 LTE Cat4 WiFi dongle comes to our eyes. 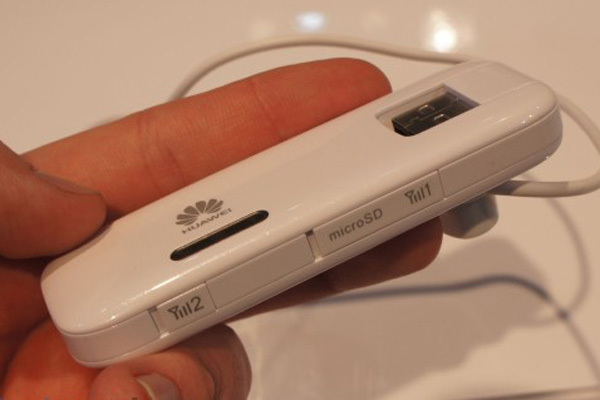 Huawei E8278 is the world’s first LTE cat4 WiFi dongle; it could support 4G LTE FDD and TDD network at 20MHz. The maximum download speed could reach 150mbps and upload speed could reach 50mbps under 4G FDD network; with TDD network, the downlink and uplink speed are 112Mbps and 10Mbps. With better function than Huawei E355, Huawei E8278 could connect up to 10 WiFi users. From this point, Huawei E8278 is a 4G mobile pocket WiFi without battery. So if with a mobile power charger, Huawei E8278 would become a real LTE cat4 Mobile WiFi. Different from Huawei E355, Huawei E8278 incorporates 2*2 MIMO, which would obviously improve the transmission speed. And there are two external antenna connectors. Besides the logo, there is indicators which telling the signal strength, message and WiFi status. The USB of HUAWEI E8278 is rotatable, the rotating USB could plug to a power adapter. After working with a power adapter, the HUAWEI E8278 would become a Mini mobile WiFi Hotspot, and the advantage is that the Wingle E8278 could keep working with the continuous power supply. Except for SIM card slot, HUAWEI E8278 has a MicroSD card, the extended card capacity could reach 32GB. So the users connected with HUAWEI E8278 would share the files or documents in the SD card inserted in E8278. As the leader of LTE technology, HUAWEI is always bring amazing gadgets and fantastic experience to the user through the mobile terminals. These are all based on the advanced technology.